A leaping Trea Johnson (25) and Caleb Edwards (8) celebrate after Johnson blocked a Grace Christian punt that teammate Monroe Beard recovered in the end zone for a second-quarter touchdown Friday night. The Irish won 32-29. Notre Dame’s offense struggled to find the end zone Friday night against Grace Christian of Knoxville. Thank goodness the Irish special teams and defense played lights out. Cameron Wynn returned a kickoff 82 yards. Touchdown. Trea Johnson blocked a punt and Monroe Beard recovered in the end zone. Justyn Baker had a 63-yard interception return. Touchdown. Hunter Hill kicked a 29-yard field goal that turned into the winnings points. 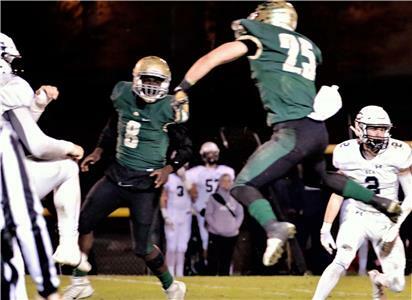 Those big plays enabled Notre Dame (10-1) to beat the visiting Rams 32-29 at Jim Eberle Field in a TSSAA Division II-2A quarterfinal showdown. Notre Dame wound up with three picks, one each by Beard, Baker and Kolby McGowan. Beard and Wynn had sure interceptions slip through their fingers. Jeffery Watkins scored on a 1-yard run for the Irish offense’s only TD. 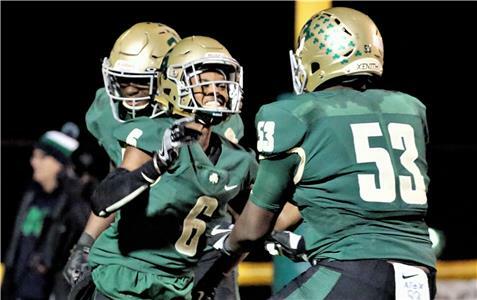 The Irish, who beat the Rams 35-27 during the regular season, advanced to the semifinals next week and will host Christ Presbyterian Academy (10-2), which defeated Knoxville Webb 22-7. The other semifinal showdown pits Lausanne (11-0) and Battle Ground Academy (11-1). While Notre Dame is 6-8 all-time in the quarterfinal round, it has yet to win in five previous tries in the semifinals. The five previous trips to the semifinals have proven futile for Notre Dame. The Irish lost to Maryville 21-14 in 1978; lost to Briarcrest 42-20 in 2004; dropped a 48-34 shootout against Livingston Academy in 2005 and then lost to Alcoa 28-19 (2014) and 42-2 (2015). The Irish, who have won nine straight games since losing to Baylor, 42-21, in the season opener, is hoping a sixth try at a semifinal win may finally unlock the door to the championship game. Special team play paid dividends with Notre Dame’s first TD midway through the second quarter. The Irish forced a punt from the Rams’ 31. Johnson took advantage of a path-clearing block by teammate Jalen Derrick, broke though the protection, stuck his arm up and blocked Ryan Medders’ kick. The ball bounded into the touchdown and in a mad scramble in a gridiron scrum Beard came up with the football, giving the Irish the early lead. The Rams retaliated with an 81-yard, seven-play drive that was capped by Jonah Duggins’ catch on a 30-yard pass from Luke Kirby. Fourteen seconds later, Wynn crossed the goal line after zipping through the entire Rams coverage unit for a TD that gave the lead back to the Irish at 15-6 with 3:05 left in the first half. An Irish drive to start the second half ended when Caleb Edward fumbled after a short gain and Grace Christian’s Jackson Daniel recovered at Notre Dame’s 43. On the next play, Baker stepped in front of a Rams receiver, snagged the interception and bolted 63 yards, extending the Irish lead to 22-6. Back came the Rams, unleashing an 80-yard, 10-play march. Kirby connected on a 20-yard TD strike to Eli Nordhorn and that same duo converted the two-point try. The Rams trailed 22-15. The Notre Dame offense finally got in on the scoring parade. The Irish, aided by a personal foul (targeting) penalty, went 60 yards in seven plays and Watkins punched it in from 1 yard out. Notre Dame again had breathing room at 29-14. As the game flipped into the fourth quarter, Notre Dame, who will be making their third semifinal appearance since 2014, quickly moved 58 yards, but the drive stalled. On fourth down, Hunter Hill kicked a crucial field goal to push the margin to 32-18. The Rams immediately struck back, thanks to a 52-yard Kirby-to-Nordhorn. Cody Estep scored on the next play, a 4-yard burst into the end zone. That cut the Irish’s lead to32-22. The next Notre Dame drive fizzled at the Rams 47 and Grace Christian blocked a punt and took over at its own 42. That opportunity went out the window on McGowan’s interception. Grace’s final possession started on the Irish 33 with 59.4 seconds remaining. Benefitting from an unsportsmanlike penalty on the Irish, the Rams quickly scored on Kirby’s short toss to Estep. The point-after kick pulled Grace to within three points with 17.6 seconds left. The late penalty could have turned into a disaster. When Johnson came up with his grab on the pooch kick, the Irish were able to breathe easy for the first time all night. Alex Flemister (53) of Notre Dame congratulates Justyn Baker (6) following Baker's 3-yard 63-yard interception return for a touchdown in a 32-29 TSSAA quarterfinal playoff victory over Grace Christian at Jim Eberle Field.